Failure of Swachh Bharat - Can India ever become clean? Home Issues Can India ever become clean? OpinionCentral - Can India ever become clean? Indians had faith that the Modi government would clean up India, that the Swachh Bharat campaign would work. But more than two years after the Swachh Bharat program was started, the situation is bleak. And the Namami Gange project is falling apart. Rivers are the most sensitive to the stock and flow of rubbish. 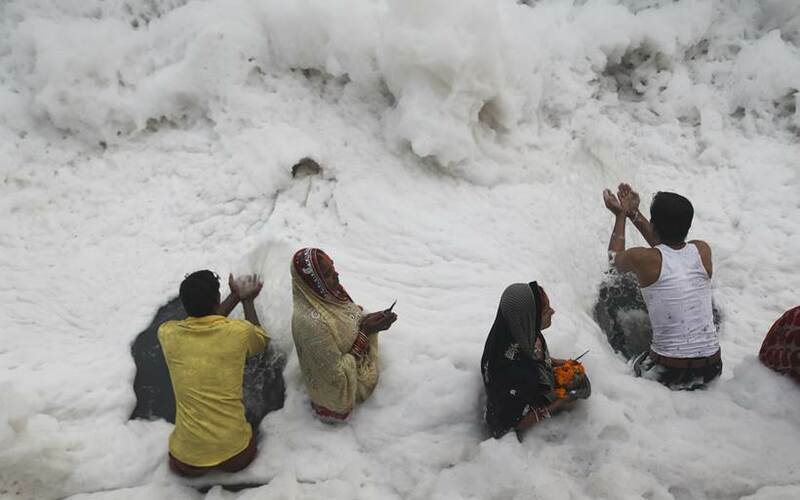 The pictures below show the deplorable condition of the Yamuna. 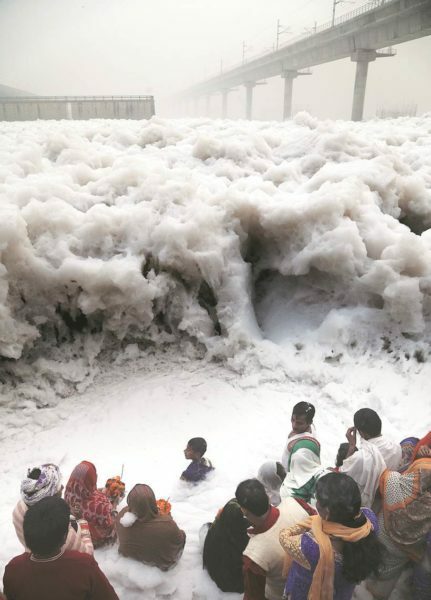 People celebrating Chatth puja at Yamuna near kalindi Kunj, The Yamuna is pollutesd to a the level of surf and the people is already suffering with the air pollution. Express Photo by Abhinav Saha. November 11, 2016. People celebrating Chatth puja at Yamuna near kalindi Kunj, The Yamuna is pollutesd toa the level of surf and the people is already suffering with the air pollution. Express Photo by Abhinav Saha. November 11, 2016. And this picture of Ganga from the internet. Actually, it is not by chanting slogans but through a new governance system that India can become clean. Unfortunately, the BJP and Mr Modi are godchildren of Nehru, followers of the socialist ideology of Congress. Accordingly, they are determined to retain the colonial governance system that the British left behind. India’s run-down, self-serving machine governance machine is designed to loot the people. Virtually nothing that is intended for the people reaches them, or can reach them, unless this rotten governance machine is replaced. The filth that litters Indian streets, rivers and lakes has nothing to do with the habits of the people and everything to do with the inefficiency and corruption of the unaccountable political system and colonial bureaucracy. India needs urgent electoral reforms to ensure that the country gets honest politicians at all levels. It needs to get rid of tenure and automatic promotion at all senior levels, including in local governments. Key performance indicators need to be included in municipality CEO contracts, so that if a CEO fails to deliver, he or she can be immediately fired. CEOs must be further empowered – to hire and fire officials who work below them, on the basis of performance. Of course, the contractual CEOs and other contractual senior officials need to be paid very well and rewarded if they perform. Without these basic reforms Swachh Bharat must necessarily fail. Indeed, funds earmarked for it will necessarily be stolen. That is the nature of the Indian governance machine. Only highly competent local governments can implement policies to deliver a clean India. For example, e-procurement that uses modern auction design must be used to procure professional services to clean streets and public places. The contract design must ensure that successful bidders are held to account. Constructive compliance policies must be implemented. Citizens must be educated and given access to waste bins at convenient locations. Compliance officials equipped with cameras must be empowered to impose significant on-the-spot fines. However, the key is that the buck would stop with the CEO. In this process a vast number of new jobs could be created. India could also attract millions of foreign tourists and billions of dollars worth of investment. Once the incentives are right, India will become clean. I disagree that the lack of cleanliness has anything to do with people. The author simply blames the government. Why do people litter ? What does that have to do with the government. In the West and Japan, people don’t throw trash where they want. They wait to find a dustbin. Look at the trains here? Vast majority of the passengers toss the garbage out of the window. And that stuff can never be cleaned. It is very much due to people with dirty habits, and who do not care at all about the surroundings or nation. No, it is 100 per cent due to the governance system. In the West, too, 100 per cent due to governance. In India wherever governance works (e.g. in Delhi metro), the same Indians never spit/ litter.